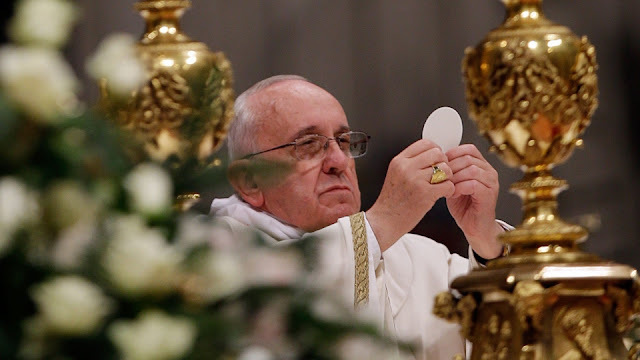 Pope Francis celebratedt Mass on New Year's Day, the Solemnity of the Mother of God. On 1 January, the Church also observes the World Day of Peace. The Gospel goes on to say that Mary kept all these things, pondering them in her heart. What were these things? They were joys and sorrows. On the one hand, the birth of Jesus, the love of Joseph, the visit of the shepherds, that radiant night. But on the other, an uncertain future, homelessness “because there was no place for them in the inn” (Lk 2:7), the desolation of rejection, the disappointment of having to give birth to Jesus in a stable. Hopes and worries, light and darkness: all these things dwelt in the heart of Mary. What did she do? Shepondered them, that is to say she dwelt on them, with God, in her heart. She held nothing back; she locked nothing within out of self-pity or resentment. Instead, she gave everything over to God. That is how she “kept” those things. We “keep” things when we hand them over: by not letting our lives become prey to fear, distress or superstition, by not closing our hearts or trying to forget, but by turning everything into a dialogue with God. God, who keeps us in his heart, then comes to dwell in our lives.